Finding new and exciting ways to advertise at your hotel can be a struggle. After all, you’ve already put so much time and energy into having an amazing guest directory designed. What more can you do? North American Directory Services luckily has a few suggestions if you are starting to hit a wall concerning new ways to promote your business or other businesses you are in partnership with in your town. Below you can find just a few ways NADS can make your advertising experience more beneficial. 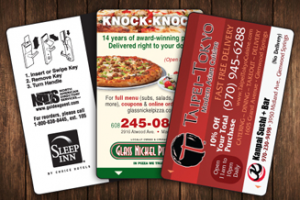 Whether you want to advertise other hotel locations, or local businesses in your town, key cards are a great way to go about it. Think about it: Guests have to bring their key cards with them everywhere they visit in your hotel and there’s nothing stronger than the power of repeated suggestion. Whether your guests are in their room or at the front desk, having pens that boast your hotel’s name and address is always a smart tactic. We all know that inherently we are all pen thieves. So let your guests have the option of walking away with your pen in hand. The next time they use it they will be likely to recall the great experience they had at your business and consider returning any time they are back in town. In a society that revolves around technology, often classic ways of advertising fall to the wayside. However, business cards are still a very effective method of advertising. Giving a hotel guest a business card upon their departure will allow them to recall your hotel’s name and address much more easily than simply recommending they check out your Facebook page.